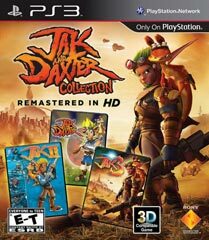 Continuing on the recent HD re-release bandwagon for the PS3, Naughty Dog has jump onboard with the release of the Jak and Daxter HD collection. A 720p update of the original 3 PS2 games, Jak and Daxter: The Precursor Legacy, Jak 2: Renegade and Jak 3. All 3 were fantastic games when they were originally released and continue to hold fond memories in the hearts of gamers. When most people might be saying ‘why’ at another HD cash in, we’re saying ‘What took them so long’! Even though this is a rerelease of a popular series of games, I’ll be keeping this review spoiler free. Being the first game in the series, and therefore the oldest game in the HD collection this is the one that gets the hardest look at how it stands up compared to today’s standards, as the series was at its youngest, controls and gameplay still experimental while still naturally adhering to the quality previous Naughty Dog games had led us to expect from them. While worth mentioning that the collection was not made by Naughty Dog they did have involvement in the development of the collection. Many elements that this game produced went on to become staples of video games in the future for big adventure games, perhaps the biggest was the open world that streamed from the disk ensuring that as you played the game you were never interrupted by loading screens. This always led to the game feeling like one huge world. This illusion is never broken in this release. I never encountered freezing for loading even when rushing between areas, a problem that still occurred in the God of War Collection. As for the game mechanics themselves nothing seems to have changed either, the game feels as responsive as it did then. One issue that does often present itself when it comes to playing older games on the PS3, this is not specific to HD Collections but all previous generation games, is the controller changes; while nothing major changed, the R2 and L2 buttons can often cause issues when precision is required. This doesn’t become an issue in the Precursor Legacy, though I’ll address it again later on for the other games. This game is the most colourful and vibrant of the 3 games and it remains that way in this release. The world feels just as great to run around in now as it did the first time I played the game. The game passes the test of time and as a plat former it’s just as relevant now as it was then. When it comes to the second entry in the series, I almost feel like I have to repeat everything I said for the Precursor Legacy. See the second entry in the series completely changed the game, falling into the future you’re faced with a whole new world and a whole new worlds worth of game features. If the first Jak and Daxter was Crash Bandicoot in an open world adventure then Jak 2 is Grand Crash Auto in spirit; we now have guns, vehicles and dark transformations. The world is darker; again the world looks great and is free from technical issues, controls for various vehicles you can commandeer around the city all handle as I remember them. But this is where the PS3 controller starts to become a small issue, given how quickly you switch the vehicle between levels of flight during some of the timed missions, the bumpers don’t give you that precision. The rest of the game handles as I remember once again, this applies to the games faults as well, circuit racing which comes up under the story is particularly painful at times to control, while the rest of the game is known for being overly hard, it’s never through a lack of control, and when you die you feel like you were out matched. This remains so in the HD version as well. 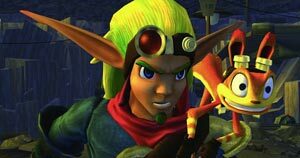 Jak 2 was the true crown jewel of the collection and arguably the best game in the series as a whole; it’s a vast improvement as well as deviation from its first instalment and its more tight and challenging then its successor. Thankfully that doesn’t change here with the updated version, it’s not quite perfect but that’s something that’s no fault of the game, given the controller changes in the PS3s evolution, and while this makes a few driving missions harder, it’s still manageable and over time you adjust to it. 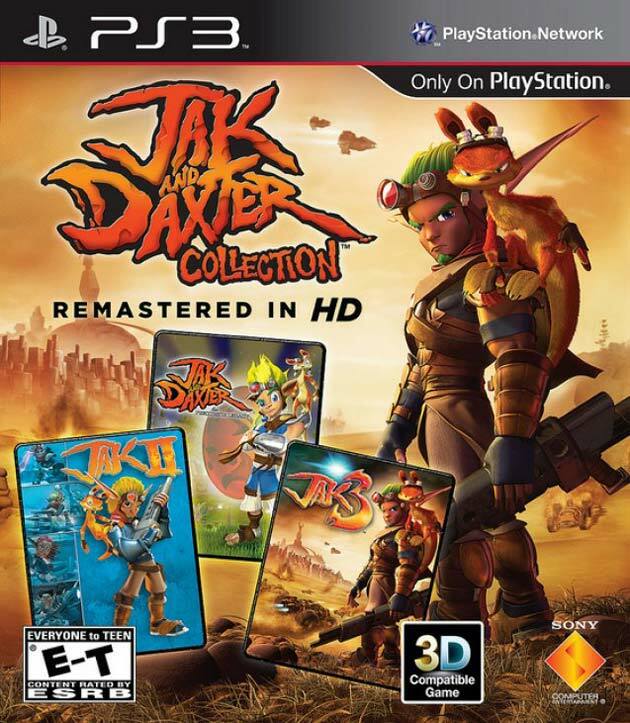 The third and final game in the collection isn’t as big a change compared to the stark contrast between Jak 1 and 2, it’s also perhaps the most bland of the games given that it takes place in the desert wastelands 80% of the time. Though what it does do is create a world bigger than anything else that came before; the world feels massive because it really is, and once again the HD version is up to par when it comes to streaming the data as you drive across the landscape. 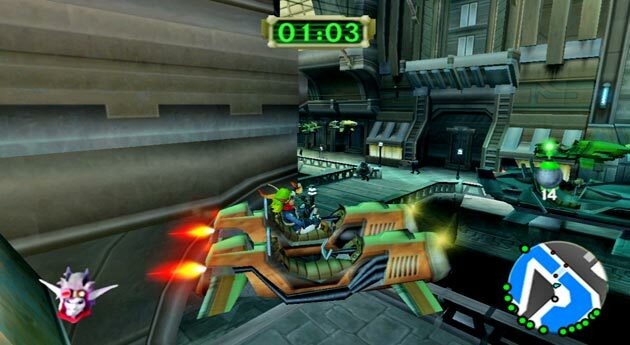 Driving has the biggest focus yet during the game, with a wide variety of vehicles to pick from, with weapons, boosters and even the ability to jump, along with even more guns adding more strain to the bumper controls, though after the toning down of the game compared to Jak 2 it’s not nearly as big an issue. My memory of the original games isn’t good enough to tell if particle effects in the game are much different to what they were when driving around the desert, but it feels like it should be and that’s the objective here. There isn’t much else to say really regarding Jak 3 given that what I said about Jak 2 applies here too, even more so when you find yourself back in the city later on. 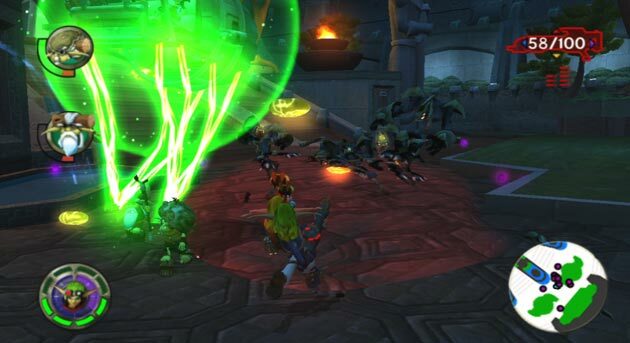 The one other feature Jak 3 had that was new was flying level. 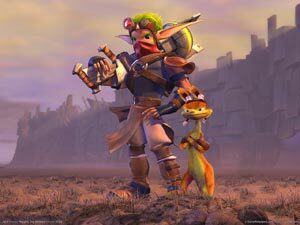 While that worked well, it felt tacked on even then, but in retrospect playing through it again, it feels like a part of the game now… maybe that’s because of the direction future Jak games took. The quality of the HD upgrade itself it very high. Again I suspect this in part to be because of the involvement of Naughty Dog in the process and their high standards. It so far has performed very well given that my experience of HD remakes so far hasn’t always been perfect; While the Sly Cooper Collection was flawless and even had added on Playstation Move Mini games, the God of War collection had loading problems and the Prince of Persia Trilogy missed a few textures on the update that led to a few pixelated models in a few areas of the games. I can’t imagine that the process of making an HD update of a game is easy, especially 3 of them, and ones being on such a grand scale as the later games. I would think this is why we tend to see few RPGs re made in HD, but this collection has been done to a very high standard and I can only hope that this continues with future collections… and if we’re very lucky a second Jak collection, though I’m sure there would be less potential return for the publishes with all the best games being in this collection. 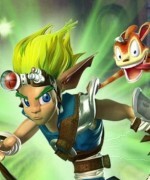 I’d love to get an HD version of Daxter and Jak X! I don’t generally score games, so I’ll simple say that this collection is a must buy! 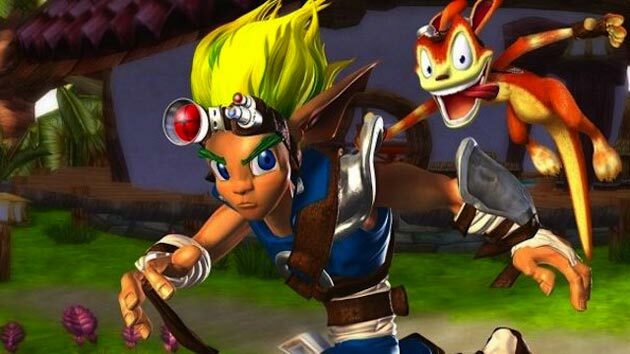 If you’ve never played the Jak games up to this point go and slap yourself then buy it and if your returning to the series give it another go. While some people might see these updates as a cash in, I personally love them as I want to see my old games again in widescreen and with trophie support. I think it’s great that it can introduce a new generation of gamers to the great games of previous generations… and GREAT is the word you use when you refer to Naughty Dog games! 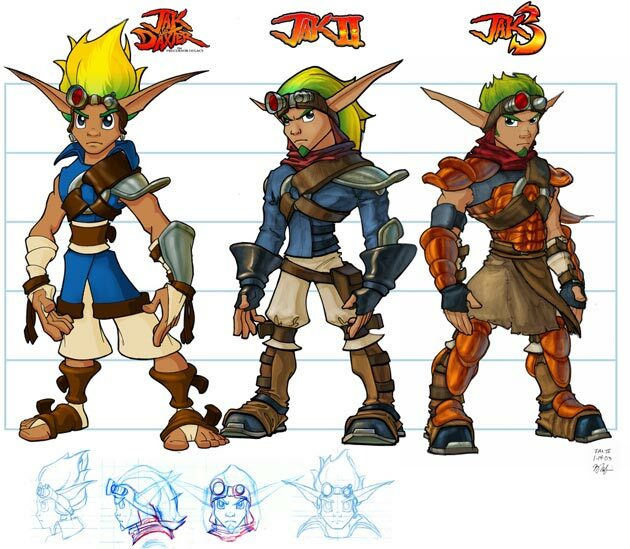 So go buy the collection and support Jak and Daxter… might just nudge them back into making a new instalment someday! About the Author: David is a Technical Animator, and has worked on creating Xbox 360 and IPad games. In his spare time he writes reviews and articles about Films, TV, Games and Tokusatsu Shows. For more from David, visit his website or follow him on Twitter.